Canada had one of its strongest showings ever at the Downhill world championships on Sunday in Leogang, Austria, with Holly Feniak winning the Junior women's title, Steve Smith winning bronze in the Elite men's race, and three Canadian women placing in the top-ten in the Elite women's race. 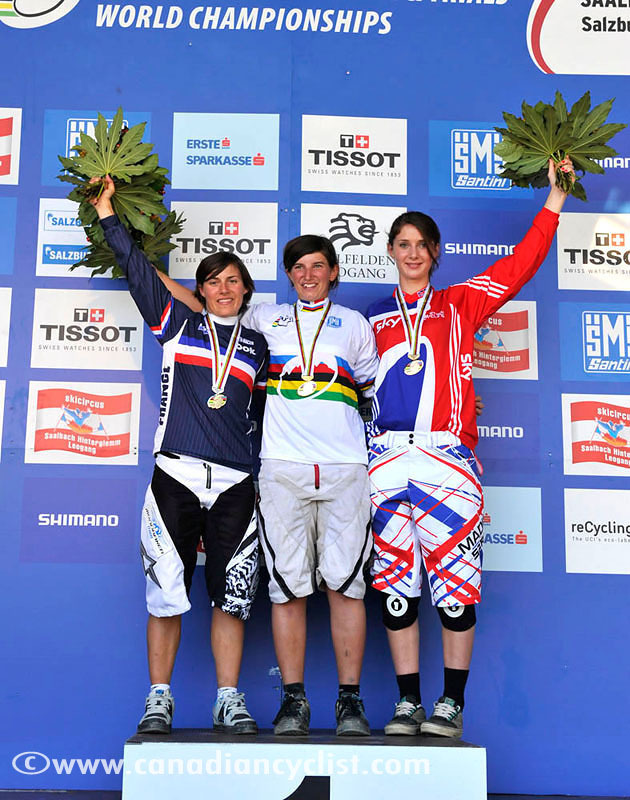 Morgane Charre (France) took her first world title in the Elite women's race, while Greg Minnaar (South Africa) returned to the top step of the Elite men's podium after a nine year absence. The women's race was expected to be between defending champion Emmeline Ragot (France) and Rachel Atherton (Great Britain), the two riders who have been battling it out all season in the UCI World Cup. However, Atherton was not a factor in the race, suffering from an undisclosed injury and finishing fifth. After Canadians Micayla Gatto and Casey Brown came close to breaking the four minute barrier, Charre obliterated it, taking the lead time down to 3:50.654 with six riders remaining. Countrywoman Floriane Pugin came within 1.617 seconds, with last year's Junior world champion Manon Carpenter then getting a tenth of a second closer. Ragot was next, but she could only get within 1.2 seconds, leaving Atherton the only rider who could deny Charre the championship. Atherton was within two-hundredths of a second after the first intermediate time check, but faded badly in the second half of the race, allowing the 22 year old Charre to step into the rainbow jersey. "I did not expect this," admitted a stunned Charre. "I thought that Emmeline [Ragot] would beat me for sure, or Atherton. I had a very good run and pedalled a lot, with only little mistakes, but I have never had a result like this before." At one point, all four of the top spots were held by Canadians and, in the final standings, Micayla Gatto was sixth, Casey Brown seventh, Claire Buchar ninth and Lauren Rosser 11th. Miranda Miller was 17th. "It was a physically demanding course. This is my best result at World Champs to date," said Gatto. "I went around a few things I should have jumped. That was kind of a mental block for me this year. I now know what to work on for next year." "The Canadian team staff was amazing all week, from physiotherapists to mechanics to coaching. Everyone was so organized, and it took the stress of any and all our planning. Our accommodation was amazing, and we had great food all week. All those definitely made me concentrate on my race." In the men's race, there were a dozen strong contenders, and Minnaar's victory came down to the wire. Australia's Bryn Atkinson set the first sub-3:30 time, with nearly 50 riders to go. Sam Dale (Great Britain) quickly took off three-tenths of a second and held the Hot Seat for 20 riders before he was replaced by Florent Payet (France), with a drop of two seconds in the lead time. Australian Mick Hannah took the leading time below 3:24 with ten riders to go, but was immediately replaced by Canada's Steve Smith, who was bumped by Gee Atherton (Great Britain) with two riders left to finish. Minnaar came in next, half a second ahead of Atherton, but everyone knew that the final rider, American Aaron Gwin, could quite easily upset the standings. Gwin has won an incredible nine World Cups in 13 races over the past two seasons, so everyone was waiting to see what he could do. However, it became apparent early in his run that Gwin was suffering mechanical problems, eventually finishing a distant 83rd, after his brakes, in the words of the team manager, 'exploded'. 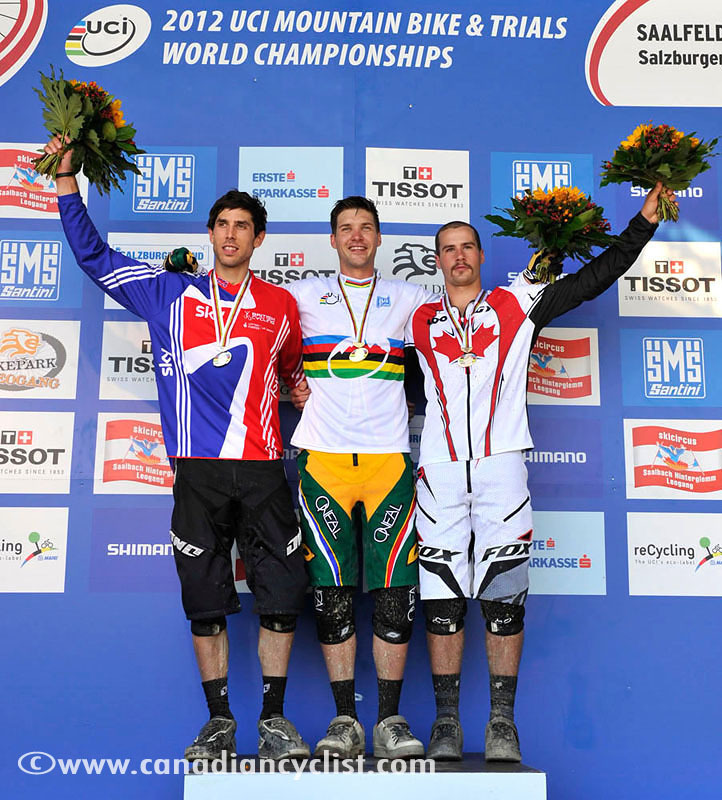 Minnaar jumped to his feet from the Hot Seat as he was mobbed by well wishers, ecstatic to win his second world title. "It’s been nine years and this run it was tough," commented Minnaar. "I had a lot of pressure today, I was super nervous. To be honest, I tried to nail the top section, just after the bridge I lost a lot of speed, I had to pedal hard. But I held it together, in a way same as in the Pietermaritzburg World Cup earlier this season. I couldn't believe I crossed the line in first." "I am a bit bummed for Gwinny, he seems to have had a mechanical, I am not sure what happened. It is not exactly the best way for me to win, or how I'd like to win, but we are all out there trying our best. We all have mechanicals from time to time, that's part of racing." Smith was hoping for better, but happy to make the podium. "I was really worried that I would end up fourth. You always come to the championships to win, but I'm pleased to make the podium. After the rain of the last couple of days the course was drying up today, but there were still slippery sections and I made a mistake at the top of the course that cost me some time. The track was awesome - quite grippy as the sun was out all day. I can’t believe the crowd; I have been here twice now for World Cups and they didn’t even have half the crowd we’ve had today. There were people all the way down, it was full of people, so it made the race good. Overall, it was a good run, and I had a good championships." In the Junior women's race, Feniak qualified in first place during the seeding run of the 2600 metre course, and therefore was the last competitor to ride in her Under-18 category. Feniak was fastest at both intermediate time splits, and beat silver medalist Tahnee Seagrave of Great Britain by 8.095 seconds. Danielle Beecroft of Australia finished third. "I was actually worried that I hadn't finished on the podium," admitted Feniak, "because I made a few mistakes on my run. So when the time came up on the board that I had won by eight seconds, my first feeling was relief. I haven't been racing the World Cup races like some of the other girls, so I didn't know how I would do. It still wasn't quite sunk in yet." "The first day of practice wasn't really good for me. I didn't feel confident on the track. I came back to the hotel and said to myself 'I came all this way, spent all this money, I cannot go in to tomorrow and be scared and afraid of the track. I have to push through it, focus'." "I did that on the second day, and that's when I came up with the speed, and the confidence. I brought that confidence in today. Today was worst run, very sketchy and pretty scary. I am very lucky I squeezed up and made it to the top." "[What] I cannot say enough about this whole week is the incredible support of Cycling Canada and the National Team. Team Canada this year has been incredible. We are all really good friends, and it's been really fun. The coaches have been so supportive - the best coaching I ever had. They are really helpful, I didn't have to worry about anything but my riding. That's a really great feeling. I definitely couldn't have done it without them. The mechanics have also been unbelievable. I can't find words to describe how much of a big help it is to have them take your bike, clean them up, dial it for you. Coming the next morning with a completely dialed bike is great to ride." In the Junior men's race, Canada did not fare as well. France's Loic Bruni, a World Cup podium rider easily took the victory, ahead of Richard Rude Jr (USA) and Connor Fearon (Australia). Canada's McKay Vezina qualified a day earlier with a strong sixth place, but after having to take a rerun (along with Rude) when a rider crashed on the course ahead of them, he then flatted on his next run. The top Canadian finisher was Forrest Riesco in 25th.